Click Here to view the "QSR Reviewer Brochure"
The Quality Service Review (QSR) is one critical component of the Continuous Quality Improvement (CQI) process. The QSR supports a team of certified QSR reviewers to gather information directly from families, children and service team members so that they can assess the current safety, permanency and well-being of a child/youth while also evaluating the system's ability to implement Pennsylvania's Practice Model which provides a basis for promoting and strengthening best practice. about being a QSR Reviewer? NOTE: Dates and times will be updated as information becomes available. WHAT IS THE CONTINUOUS QUALITY IMPROVEMENT EFFORT? Casey Family Programs and the National Resource Center for Organizational Improvement (NRCOI) define continuous quality improvement as the complete process of identifying, describing, and analyzing strengths and problems and then testing, implementing, learning from, and revising solutions. It relies on an organizational culture that is proactive and supports continuous learning. CQI is firmly grounded in the overall mission, vision, and values of the agency. Perhaps most importantly, it is dependent upon the active inclusion and participation of staff at all levels of the agency, children, youth, families, and stakeholders throughout the process. Pennsylvania's CQI approach is therefore not another new initiative, but an effort to reshape the system at the local and state level to support the achievement of positive outcomes for our children, youth and families. We believe that the CQI process will support staff in improving their practice which will ultimately lead to healthy children, youth and families. Full implementation of the CQI effort across the Commonwealth represents a multi-year effort that will be conducted in a phased-in approach. As each county joins the CQI effort, they participate in a state-supported QSR. During Phase I, there were six counties that joined the CQI effort. Those counties included: Allegheny, Butler, Lackawanna, Philadelphia, Venango and York. During Phase II, there were five counties that joined the CQI effort. Those counties included: Beaver, Dauphin, Lebanon, Washington and Wyoming. During Phase III, there were seven counties that joined the CQI effort. 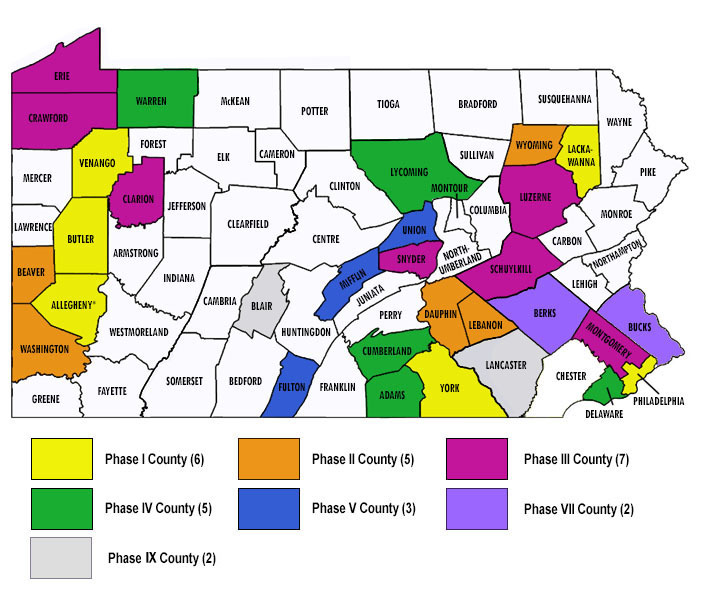 Those counties included: Clarion, Crawford, Erie, Luzerne, Montgomery, Schuylkill, and Snyder. During Phase IV, there were three counties that joined the CQI effort. Those counties included: Adams, Cumberland, Delaware, Lycoming, and Warren. During Phase V, there were three counties that joined the CQI effort. Those counties included: Fulton, Mifflin and Union. During Phase VII, there were two counties that joined the CQI effort. Those counties included: Berks and Bucks. Each county involved in the CQI effort receives a final report of the findings from the cases that are reviewed during the case review process. Information from the QSR is analyzed in conjunction with other sources of data so that the county conducts analysis to inform its strategic decision-making about how best to enhance practice and sustain improved outcomes for children, youth and families. A County Improvement Plan (CIP) accompanies each QSR Final Report, as it is it the CIP that outlines the strategies and action steps that will address the priority areas in which they are focused at improving. Go to the Service Code drop down box and click on "County Children and Youth Agencies". Go to the County drop down box and click on the name of the county that you are searching for Click on the button that says, Submit Search. Under the Status and License column, click on "Quality Service Review"
The following Statewide reports include the summative findings of each round of state-supported onsite QSRs which were conducted. For more information about Pennsylvania's Continuous Quality Improvement Effort, please contact Jeanne Edwards at jls192@pitt.edu.